I'm always thinking about ways to incorporate more whole gains into my diet because they are high in protein and fiber. 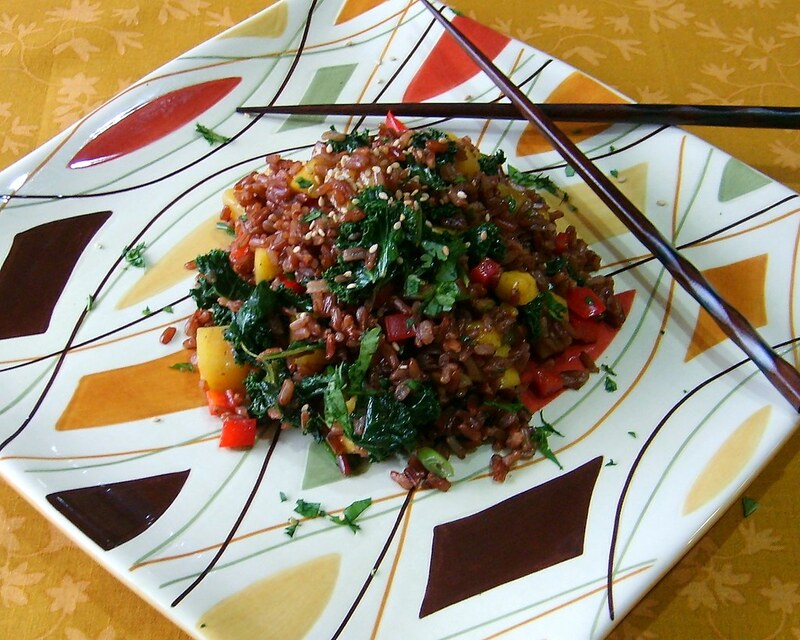 Bhutanese red rice retains its beautiful color throughout the cooking process and maintains a great texture as well. Makes you really feel like you're eating something healthy and you are! Toast spices in a dry pan and grind into a fine powder in a spice grinder. Bring water to a boil, add 1/4 tsp salt, add rice, stir, cover and reduce heat to medium low. Cook for 35 minutes. Remove from heat and let sit for 10 minutes, fluff with a fork. Whisk all marinade ingredients in a bowl, add diced tofu and set aside for 30 minutes or until rice is finished cooking. Prep all other ingredients and set aside. In a large saute pan, add tofu along with marinade and bring to a simmer. Add kale and saute until just wilted. Add rice to a large bowl, add in all ingredients, as well as tofu, kale and marinade.